Instead of paying mobile phone charges for a call or a text message, many smartphone owners prefer to use free instant messenger, or toll-free voice-over-IP services such as WhatsApp Messenger or Skype . Another alternative would like the service line be, who could now attract more than 20 million users of its own. 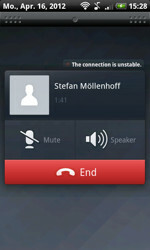 As with Skype chats and phone calls of smartphone owners over wireless or mobile Internet connection. Except for the charges for the flat rate or the volume of data will be no additional costs. Video telephony, there is not in line, for group conversations with up to 100 contacts can happen simultaneously. Smiley lovers there is a wide selection of designs to Accentuate their messages. In addition, photos can be quickly replaced or the current location communicated to the other party. With the add-on Camera Line and Line Card embellished the user then snaps his numerous filters, frames and stickers or send your own greeting cards. 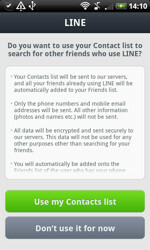 If you want to use Line must disclose when registering their phone number. To this fact, an SMS is sent with a verification code. Do not worry if the short message is not immediately in the mailbox lands, because that can sometimes take a while. Then placed still to a profile. That works on the e-mail address or simply by assigning a user name. Friends, the app will automatically search on demand out of the address book. Who his contacts would rather not send it to the server the developer skips this step. Then you find acquaintances similar to Skype based on its ID. The ID must assign each user after the first start in the profile settings. If you stand just opposite, you add contacts easily added via QR code or while shaking both smartphones. The chat works perfectly. The voice quality on the phone is not necessarily great, but we understood. The voices sound sometimes unfortunately somewhat dull and tinny. It also came on the 3G connection again and again to short interruptions of the phone call. About the faster Wi-Fi connection, there were fewer problems. In addition to the application for smartphone line has like Skype. Also a client for Windows and Mac in the program They are on the Developer's website to download. All in all Line still makes a positive impression. Many reasons to switch to line, there will not be for Skype users, but can not hurt to look. Especially for those who would like something more colorful line with its two add-ons and many smileys might be just the thing. A little tip: If after trying the app does not want to use any further, in the settings under the tab My profile delete his account, with data. If there is a problem, it helps to move the app from the microSD card back in the phone memory interen.